I wish I had liked brussel sprouts as a kid, but unfortunately they were seen as ‘un-cool’. WHY?!?! They are so delicious, and browned brussel sprouts simply prepared like my below recipe are so scrumptious (and healthy!). Try it out and change your kids’ minds on this beautiful and bright vegetable! Optional Garnish: thin slices of parmesan cheese or any other hard white cheese you enjoy! Cut off the ends of the Brussels sprouts and peel off one complete outer layer of each sprout (that is where the bitterness comes from!). Mix them in a bowl with the extra-virgin olive oil, Kosher salt, lemon juice, garlic, and pepper. 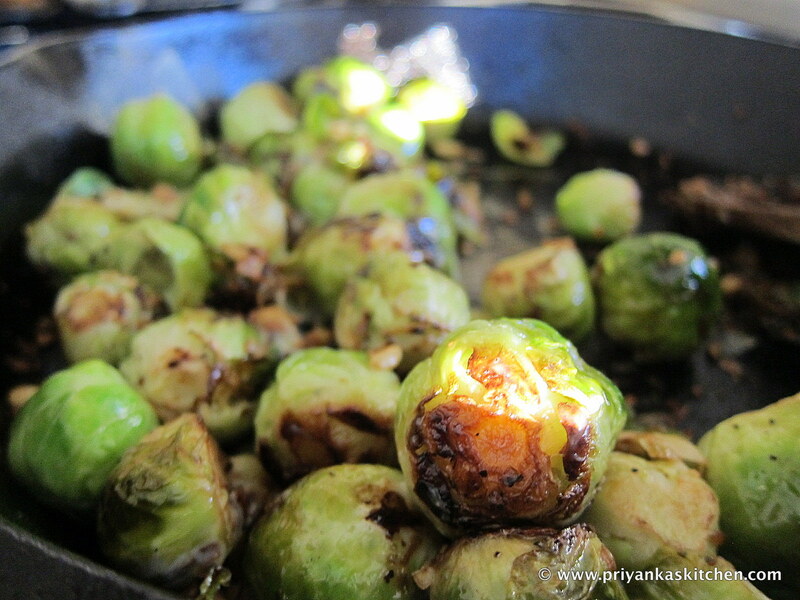 Take off of the heat, add pine nuts to the pan, and put the pan with the sprouts into the preheated oven. Cook for 20-25 minutes, until crisp on the outside and tender inside. Sprinkle with more kosher salt after baked, and serve hot! Garnish with thin slices of cheese (use a peeler on a hard piece of white cheese!) and let this melt in about 1-2 minutes just from the heat of the sprouts. This entry was posted in Heart-Healthy, Italian, Kid-Friendly, Side Dishes, Vegetarian by priyankaskitchen. Bookmark the permalink.